Well, here we are–mere hours away from 2013. So, to honor the passing year, I decided to do a little accountability check to see how well I did with this year’s resolutions. If you want to check the original post, you can find it here. Or you cou can read how I was doing near the mid-point right here. Goal #1: Run a marathon. 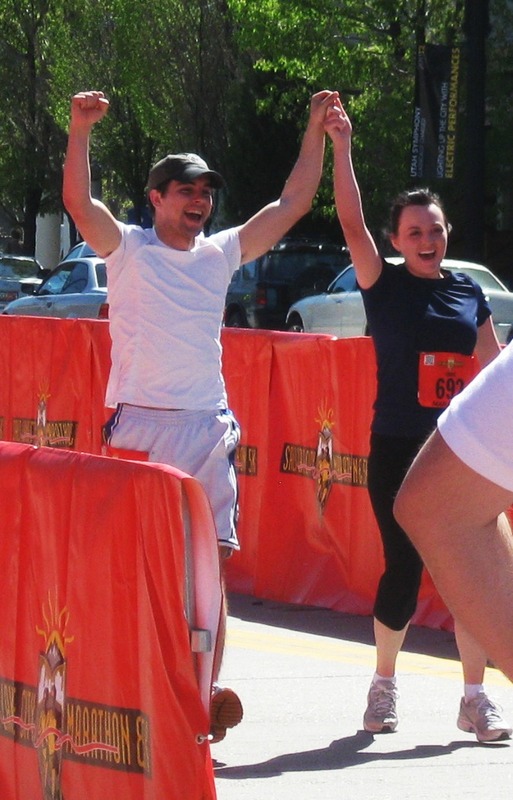 Matt and I successfully ran the Salt Lake Marathon together on April 21st (finishing hand-in-hand, as you can see) in 4:34:49. So as for my first goal, I’d say I blew it out of the water (considering that my only real goal was to actually finish). If you’d like to read more about it, check that post out here. Goal #2: Read double of what I did last year, which translates to 38 books. I tried hard on this one–I really did. But I lost my focus a bit in the summer (when I had the most time), and so I fell quite a bit short. I’m currently sitting at 23 books for the year, although I’m extremely close to finishing 4 more. So even though I didn’t quite hit the original goal of 38, I’m still feeling pretty good about this one (especially since I read more than last year, and many of the books were dense classics). Goal #3: Go to the temple every month. Goal #4: Have people over to dinner every other month. I kind of stopped keeping track of this one halfway through since we seemed to just kind of integrate this into our lifestyle. I would say that on most months we invited people over, although sometimes it was just for dessert instead of a full dinner. But, since the purpose of this was to make friends and be more social, I’d say we definitely reached this goal too. Goal #5: Finish typing up my mission journals. I managed to go full-steam-ahead on the first journal, knocking it away in about three months, but then I forgot that I’d set a goal to finish typing up ALL of them . . . so I still have two to go. Oops. Goal #6: Do the NaNoWriMo Challenge. Summary: So even though I only fully or partially completed five out of the six resolutions, I feel like I’ve made HUGE strides this year–I turned into a runner, I learned how to do family history, I knocked several books off of my life’s to-read list that I’d been putting off for years (like Great Expectations and the unabridged Count of Monte Cristo), I graduated from college, I landed my first teaching job, and I’ve formed some awesome new friendships. So 2012, I’d have to say you were a phenomenal success. Can’t wait to see what the new year brings us! P.S. If you want to see a sneak peek at one of the (HUGE) goals I’m taking on next year, check out my guest post on this adorable blog today.